Trade show marketing is an extremely effective way for brands to get in front of buyers with 82% of trade show attendees having buying power within their organizations. Couple that with the fact that trade show attendees spend an average of 9.5 hours viewing trade show exhibits on the show floor, trade shows put you in front of key decision makers and give you ample time with them. It’s during this time with buyers that you can give detailed product demonstrations, educate your customers and answer any questions that may come up. But what if you’re a manufacturer or distributor of complex and large custom products? You can’t possibly bring every product to the show floor, right? Through the power of virtual reality (VR) software, your trade show booth can become the best, most cost-effective way to experience your products from the trade show floor. By uploading and designing your configurable products to a virtual reality showroom, your target audience can visualize, interact, and explore three-dimensional products all from your booth. The best part? It can actually increase your trade show ROI. To show you just how virtual reality for trade shows makes better ROI possible, we broke down the major benefits below. If you’ve exhibited at a trade show before, you know that a lot of thought and consideration goes into designing your trade show booth for the best attendee experience. From purchasing the right displays to making sure your signage pulls people in, everything is analyzed with careful consideration and customization to leave a memorable impression. But if you aren’t able to physically show your product, how can you communicate your ideas clearly and in a memorable way? 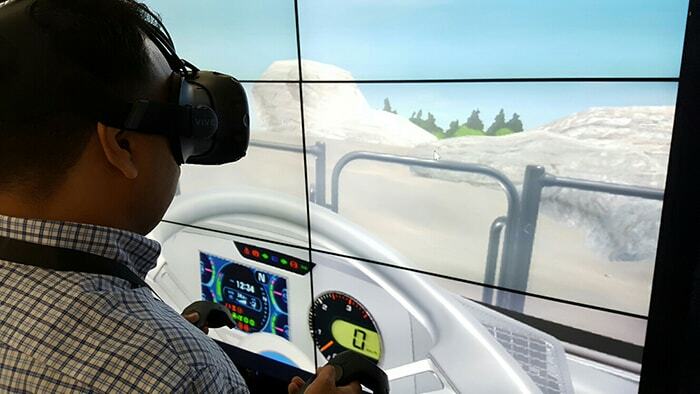 While big screen televisions and high resolution graphics might get the job done, an immersive experience like VR can explain your products more quickly and accurately. "We’re seeing more things like video, animations, and virtual reality as ways to share complex ideas quickly and accurately. This application of technology supports sharing a much larger story and lets us move beyond concerns about booth size or how much equipment we can fit in the space." With a custom virtual reality experience at your trade booth, attendees will have a more accurate feel for your products and the benefits you bring to the table. And, with this greater understanding of your products and value proposition, you can expect that buyers will feel more compelled to strike a deal with you, which improves sales and increases your return. A lot of buyers come to trade shows, as evidenced above. While you can get in front of a buyer through traditional sales methods, it may take several calls or meetings to get buy-in from key stakeholders or get in front of the decision maker. At a trade show, however, it’s likely that the stakeholders you usually need several meetings to go through are already on the show floor. By powering your trade show booth with virtual reality you can show all prospective stakeholders your product first-hand, saving a countless number of meetings, calls, and hoops to jump through. This process shortens the sales cycle considerably, accelerating deals through your pipeline and putting revenue in your pocket. For the greatest trade show ROI, your ultimate goal is to get everyone from your prospective client companies in attendance to stop by for an experience. Once you hook the first prospect, get the rest of the team in the door by offering individual or group demo appointments. If it’s hard to nail down a good time, encourage their team members to stop by whenever their available to maximize attendance. Drayage rates, the cost of transporting your trade show equipment to the convention center or venue, have increased 488% between 1982 and 2010 — just imagine how much that has increased today. Over time, this has significantly increased overhead costs and initial investment into trade shows, bringing down your trade show ROI. If you set up your trade show booth with a virtual reality experience instead of physically bringing in your products, those shipping, handling, and installation costs virtually disappear. As you may have guessed, this reduces your overall trade show investment by allowing you to leave your products and other heavy items at home. And depending on the virtual reality experience you choose for your booth — and how much you packed — you may be able to fit the equipment in your carry-on bag. Imagine the cost of exhibiting many large products or an entire facility layout at a trade show. Do you attend a lot of trade shows each year? If so, you already know that your booth design needs to be replicated (or modified) for each floor layout. Typically, this results in moving trade show materials back and forth or sometimes starting from scratch with new materials. While moving pieces back and forth is more cost-effective than starting anew, those transportation costs still aren’t cheap. 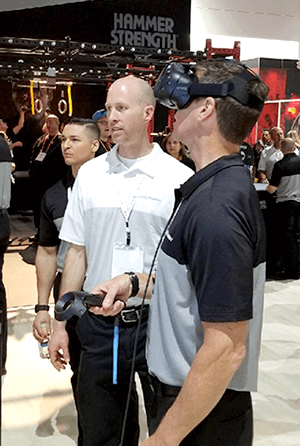 Because the virtual reality trade show experience is portable, you can recreate it at every trade show you attend this year and beyond. Simply pack up your VR equipment, usually just a headset and a couple of controllers, and move on to the next gig. This definitely beats needing to ship large products and other booth materials all over the country — or even the world. Plus, it’s the same experience across every show, so there’s no inconsistencies that might affect your bottom line. Trade shows are a unique opportunity to meet face-to-face with potential buyers — and plenty of them. Virtual reality is a great way to create a memorable experience for attendees that doesn’t break the bank. Find out how you can take your entire product catalog to your next trade show in an affordable and effective way with our virtual reality mobile showroom.